Once upon a time two Boots decided to set off on a journey. Earth Boot was strong and stable, its shoelaces were tightly tied, he wasn’t afraid of rivers, rocks or mountains. Wind Boot liked its shoelaces a bit loose, and its nose was muddy here and there, she tended to stay behind and sniff the chamomiles every so often. In the beginning the journey wasn’t easy at all. Every Boot tried to get ahead, so you can only imagine how difficult was to shuttle anywhere. Only later they understood that walking together – one Boot will be ahead at some point anyways – they will be able to walk smoothly where they needed. Even though Wind Boot saw how tight were fellow traveller’s shoelaces, though couldn’t help but notice how fine and soft its linen was. And Earth Boot used to pat often sour Wind Boot’s nose. Puddles or solid soil, it didn’t matter, they walked side by side, every day, helping each other. They couldn’t imagine travelling alone anymore. They haven’t even noticed, how have they covered numerous miles. Got worn out a bit, got shabby a bit, the bright colours were not as bright anymore, they became even similar. They still walk together, up to this day, they slog, they leap. The stars are theirs, the Sun is theirs, rivers are theirs. And I was lucky to have witnessed it all, and now I’m writing it to you. Pirmasis pasiilgtos Turkijos vaizdas iš mūsų sugędusio kelto. 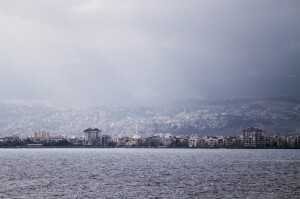 | The first view of the Turkish land. ‘Can you believe that? We are so close to Europe! It smells like home’, we take a good breath in from the bottom of our lungs. We can do it, as the air is silkier than in the desert. We are just on time to pass Egypt, we only heard the locals complaining that the time after the revolution is appalling, and they do not know what is going to happen after all. Today’s events perhaps are what they were so anxcious about. However, at the time the touristless street life was in bussiness like usual. But perhaps we were just in time to complete our journey. ‘Just few more days’ the ferry company promises us. It is silly to complain, some truck drivers are awaiting for the ferry for a month. The war in Syria halted the usual caravan from Turkey to Egypt, so now is the only option to reach Europe for us and them is a ferry. The fingers playing waltz on the table. We are sipping perhaps fifth cup of sweet Turkish tea, together with other travellers among the Syrian holiday-makers (and we thought they are refugees) and truck drivers. We haven’t reached home yet, but we are already mourning about the end of the journey. Richard in half a year made a trip around Africa. He has started in Marocco, circled via South Africa back to Egypt. He has got not only this trip in his pocket. So humbly he mentions that he has done around the world in a yacht. By himself. Just like that. Twice. That what we call real Magellans. He reached one continent, then thought to go a bit further, and then he just rounded it up. The second time was closer to Antarctica, but guess whether that was an easier trip to complete. 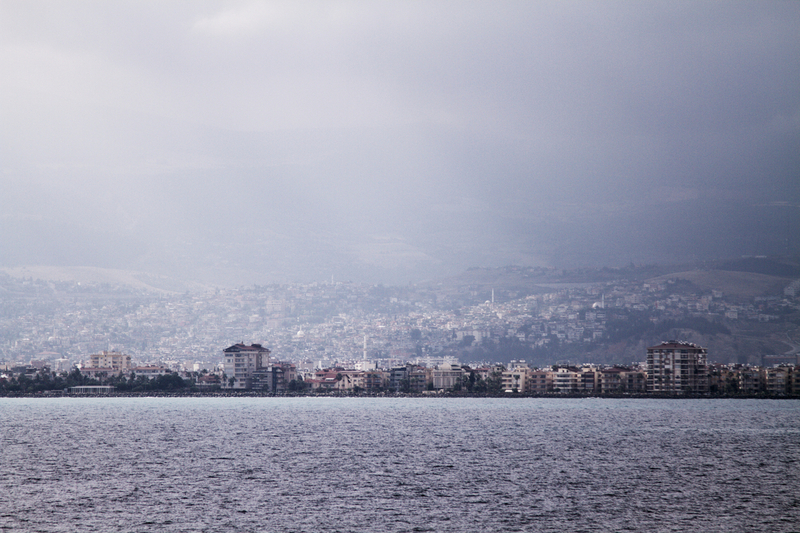 Maybe because of the storms and hardships on the boat, he does not feel nostalgia to water. Not at all. Graikijoje kviečių laukuos mes jau užuodėme Lietuvą. 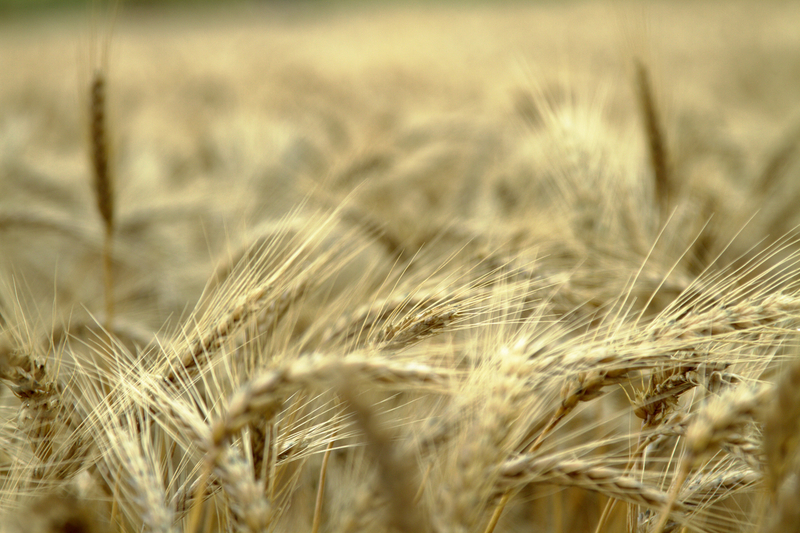 | In Greek wheat fields we felt like being back in Lithuania. Lisa and Oliver have made around Australia and then just completed South Africa to Egypt bit. These trips in the past maybe were extraordinary, but now seems to be pretty fashionable. Richard is coming back not the first time, but for us four we have quite a few issues to discuss before turning back home. How will it be to be back home? To adapt to the civilised world? Could anyone understand how is to feel like we do. Even during the trip we have received different opinions about what we are doing. ‘But this is our trip’ complains Lisa, having had to withstand few lashes of critique as why on earth are you doing things like that. ‘I couldn’t travel all the time’ she says, as the time comes when you need to give back to community all the goodness you have received. She is right we guess, as we have accumulated quite a bit of world’s treats so the need to give it back to the world is growing. Richard like a wind aims to get back to Europe, so we are lucky to get through Turkey fast. Not that we would like to pass it though, as the warm memories from the last year are still with us. But we can save some time and go through Balkans slower. In Turkey though we have officially completed the round-the-world circle. Passing the place where we have camped that winter, we could easily remember how cold was back then, and now the conditioner tried vaguely to freshen the hot air. The rain is pouring down. This the last town in Turkey. We eat the crumbs of bread with yoghurt at the closed store. Old Turks cannot look at us sitting on the ground, soon they bring us few chairs. And this is like that in Turkey, east or west north to south. Will we find the same good eyes back in Europe? The frontier officers like surgeons are trying to check every single dust on somebody’s posh looking car. We perhaps are wrong time there. ‘Where are you going?’ ‘Europe’ What are your jobs?’ ‘Nothing, we are getting back home after a long trip around the world’. He laughed out loudly and horse-ly, it sounded perhaps to him as if someone would have returned from the moon. He looked up and down at us, and instructed us to go. It seems Europe welcomed us back without major problems. The wheat fields are waving at the side of the road. The stork flies us back to home. We feel like singing some pagan melodies as we were right close to our country. But that is an illusion. The white sad houses and sour people faces witness the greek crisis. And we are sad, so sad that we felt we will cry out the tears with the rain. One Turkish truck driver stopped us later on, and out of his fatherly friendship he parked in the middle of the trafic just to give us tomatos and bread, and gave us a good strong hug. We go on the road and cry to tears. Why on earth people are so good?? How can they be so good? Pasivaikščiojimas kalnuose. | A walk in the hills. It seems just a minute ago, that we were in the whirlpool of sweet uproar, and the only left emotion here is ‘ a greek ego’ – you europeans owe us for the civilization. As they would be from the same village they all complain about other nations – Albanians are mafia, Bulgarians are of poor culture, the Turks are eternal enemies, and Macedonians have stolen the name from the Greek region. Only Germans or maybe Swedes would fit into the same category, and lots of Greeks would even know German or Swedish as their parents would have worked there. But hitchhikers would often be scared away from Greece, as this civilization cradle, with its posh seasides, islands perched with tourists, know the good value of a person, so a normal mortal does seem to be too interesting to them. Hence, after Turkey or Albania, Greece may seem a very cold land. But even in such a society there is a number of culture outsiders, rebels, misunderstoods, who would act contrary to their fellows citizens. Apostolus – one of them. Soon he mixes up cold Nescasfe for us – greeks are proud that this drink was accidently born here. He tells a sad story of his family, mourns over the mistakes from the past, shows the fields where he likes working and he is proud of. It seems that the garden is the only refuge to him. Maybe a small shy dog too, who gives companionship to him after recent his mother’s death. We perhaps would have stayed here longer, eating cheese and honey breakfasts, listening to his hard life stories, but the Road is calling. Some Greeks are unhappy at their neighbours who only gossip and demonstrate cold character at the warm Aegian sea, but yet again one greek Theo invites us home. We soon are resting at his garden house, facing the the sleepy hills, with a greek orthodox church and cemetery. We visited that cemetery with Theo to lit a canlde on his father’s grave. The cemetery here comparing with turkish ones, are posh exit to another world. And for the dinner – traditional greek salad, swimming in the olive oil. No wonder, why women here are pretty rounded and men have big authorative bellies. The rains have left to annoy the middle Europe, so the mood is uplifting. It’s a high time to continue through Balkans. Albanijos vasara. | Summer in Albania. ‘Oooo, be careful in Albania. They might be nice to your face, but then they will stab you in your back’, greek warns of unfriendly fellows. At times you need to ignore such fearful misgivings, and dip into your own experience. Albania seemed to be a closed country looked after by soviets, very poor indeed. We were surprised to see not only skyrocketing mountains, but colourful houses. How can you be even sad among brigh yellow, orange or green edifices? The people – contrary to what greeks said – are helpful and hospitable, and none tried to stab to our backs. Maybe the mafia indeed reigns here, but we just could not put everyone into the same dirty pot. Rusų prikimšti paplūdimiai. | Russian tourists occupying the beaches. This country is a lovely idyllic place. A narrow strip between mountains and seas, an ideal place for those seeking for romance. But if only you thought like that. 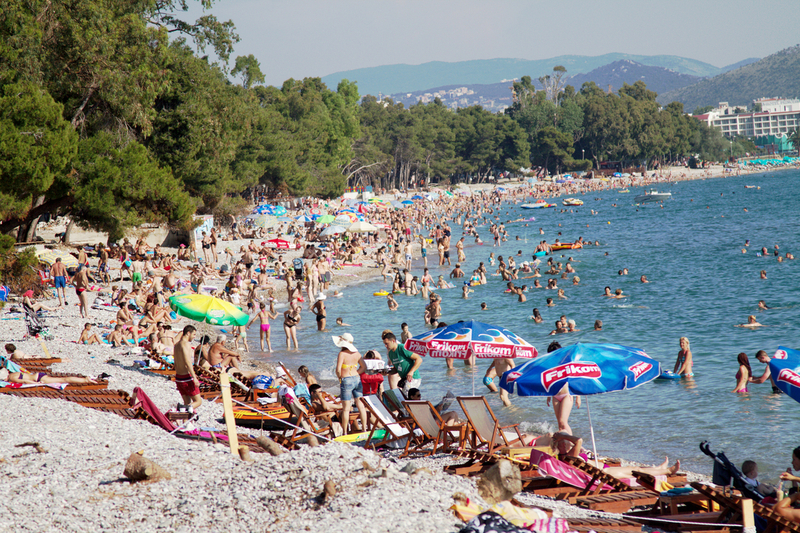 There are quite a few, who do not carry fear against exyugoslavia whirlpools, so the beaches are densly covered with Russian beachgoers, no matter what age or body structure they own, they need to have a good roasting skin to show off in front of their neighbours or work colleagues. So it’s better to get higher up in the olive woods up on the hills to see the beauty of the seaside. As long as Bosnia is not yet overpopulated with tourists, we are there to enjoy the full bounty of culture and nature. It feels like that this land is growing faster and more colourful than lets say Croatia, who at the time of the travel was one and half leg into European Union. 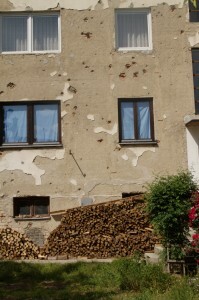 Apperently refugees help to get the houses back into order, otherwise we would have seen not only few holes still whitnessing the recent history of a war. Since Africa’s cities were madly chaotic, we truly missed some square in the old town, where we could have a cup of coffee. 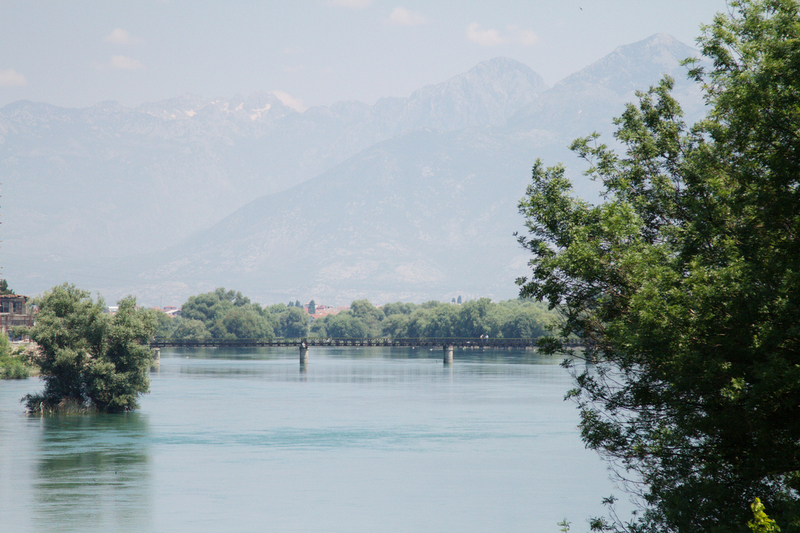 Trebinje was exactly what we dreamed about – a cozy old town with uplifted town dwellers and guests. Balcan music in the background, some kittens murr around our tired feet, and we sipping coffee one more time bring ourselves into a realization point. We are like five minutes away from home. Only some maps in somebody’s house was a pointer, what a monstrous line we have left behind. Jugoslavijos karo palikimas - kulkų suvarpyti namai. 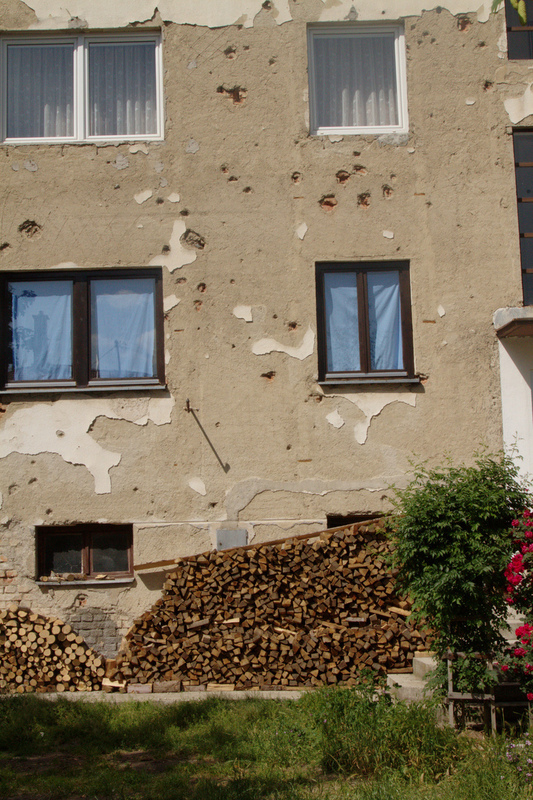 | Leftovers from Yugoslavian war - bullet holes in the walls. Serb with his son has stopped at the dusk. Some people in our journey had no clue, why on earth we are torturing ourselves with this burden, and some were saying we have been completing their dreams. This Serb was secretely following one cyclist’s journey around the world, still being surprised how people hiding away from the comfort can actually make a decision to leave everything behind and do something of that kind. And here we were, real witnesses that it is possible to do like that. He would take his bike, and leaving wife, kid, job and house behind, he would actually do that. But he doesn’t as so the others don’t do that too. But soon whilst eating our pizzas, he is telling stories from the war, and how he felt sleeping uncomfortably in his tent, and how he was shooting at the enemy, and how happy he was not to shoot at close distance. If he saw the eyes of the enemy, that would be a question, what would have he done. The history is complicated in exYugoslavia, but hopefully the dark clouds are behind, despite the fact that Bosnians (otherwise etnicless muslims), orthodox serbs and catholic croats politically are yet not in good terms. Pasivaikščiojimas Alpėse. | A walk in the Alps. Our energy slowly going down, but after having reached Slovenia with its Alpine mounts, idyllic hills and fat cows (but how can we say differently after seeing skinny cows on the Ethiopian roads), we need to do another hike. All of a sudden, we have got our spirit back in boots, and together with our Feike, dutch guy adoring Slovenia to an extent he moved to live here, we hiked there to see the full beauty of Alpian mountain-kids. And when we were running down the hills whilst the rain was pouring, we were enjoying the every drop. Hopefully adventures like that will not be the last on our adventure list of simple joys. 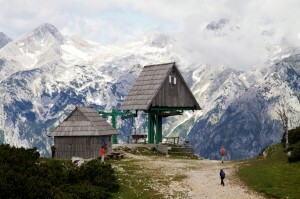 Slovenia in fact should be ideal fplace or anyone. You have got western order and eastern warmth, and if not the crisis who got here too, many more would love to move to this tiny cozy country. Suvalkai ir tolumoje mėlynuojanti Lietuva iš oro. 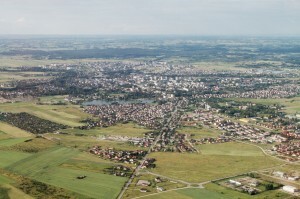 Suwalki and Lithuania in the far distance from the sky.